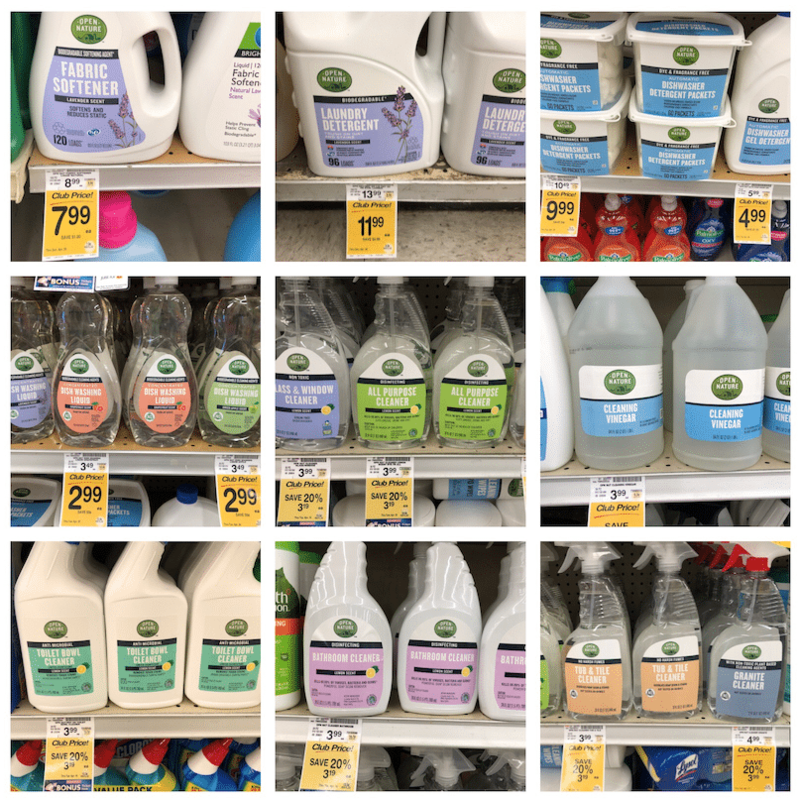 Spring Cleaning With New Open Nature Eco-Friendly Non Toxic Cleaning Products at Safeway – On Sale Now! 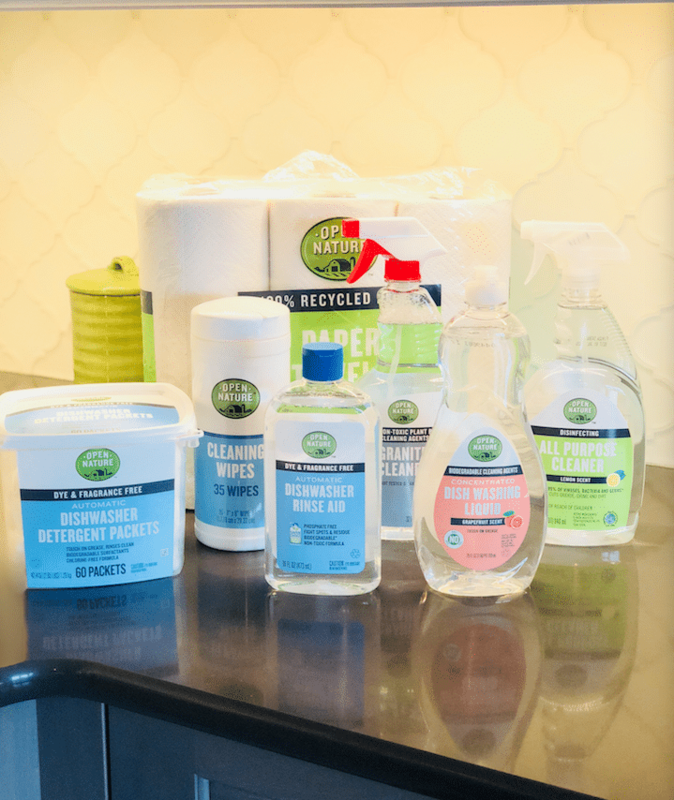 It’s time for the annual refresh and renewal of your home and no better way than to do it than to use the new Open Nature line of eco-friendly and non-toxic cleaning products available at your local Safeway or Albertsons store. The new line of environmentally friendly products help make Earth Day, everyday. All of the products are biodegradable and phosphate free, which means the cleaning agents in these products can be decomposed by living organisms such as bacteria. The cleaning line includes products that are dye-free, fragrance free and perfume free, and are never tested on animals. They are also certified Safer Choice by the U.S. EPA. All Open Nature paper products are made with 100% recycled paper and are certified by the Sustainable Forestry Initiative. While being all natural, these products provide effective cleaning power for your toughest messes. Believe me, I’ve tried all of these products and I LOVE them. If you were formally a fan of the Bright Green Line at Safeway, you’ll be happy to know that the line has been rebranded under the Open Nature name and lots of new products have been added to the line! Be sure to print our Spring Cleaning Checklist to help you get the most of of spring cleaning your home. This weekend will be cold and dreary, so it’s the perfect time to start! Open Nature All Purpose Cleaner – use this to clean up the counter tops in the kitchen and bathroom, as well the your doorknobs, toilet and even spills and messes on walls. The cleaner is dye-free, lemon scent (but not too overwhelming), disinfecting and U.S. EPA Design for the environment Certified. Open Nature Granite Cleaner – if you want your granite to shine and be streak free, this non-toxic product is perfect for cleaning your countertops in the kitchen or the bath. Open Nature Dish Washing Liquid – It’s made from biodegradable cleaning agents, dye and is fragrance free. The grapefruit scent is fabulous! Open Nature Dishwasher Detergent Tabs – Tough on grease, rinses clean with a biodegradable surfactants and a chlorine free formula – gets your dishes, glasses and silver wear clean without leaving behind a residue, so you can be sure your family isn’t getting any left over detergent with their next meal. 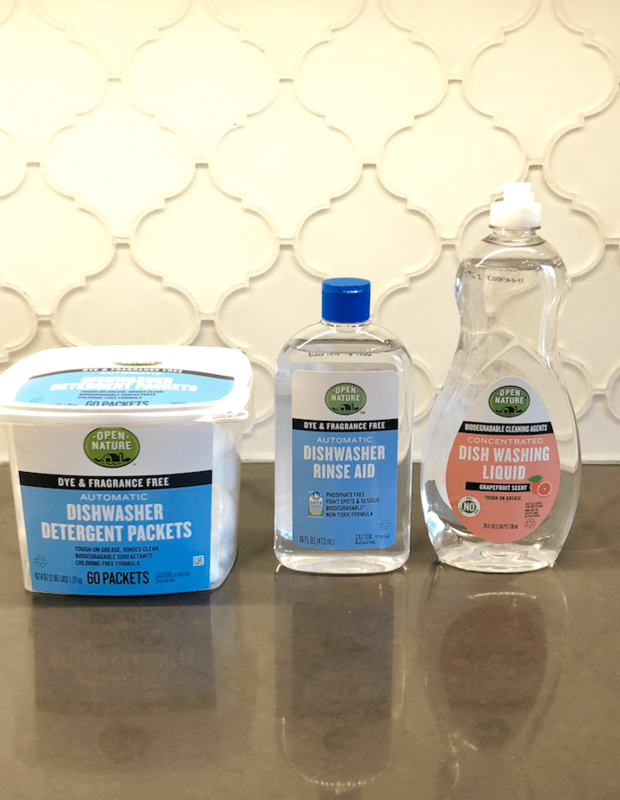 Open Nature Automatic Dishwasher Rinse Aid – I’ve been using this for about 6 months and it really works great to prevent spots and residue on dishes and glasses from the dishwasher. Phosphate free, biodegradable, and dye-free. 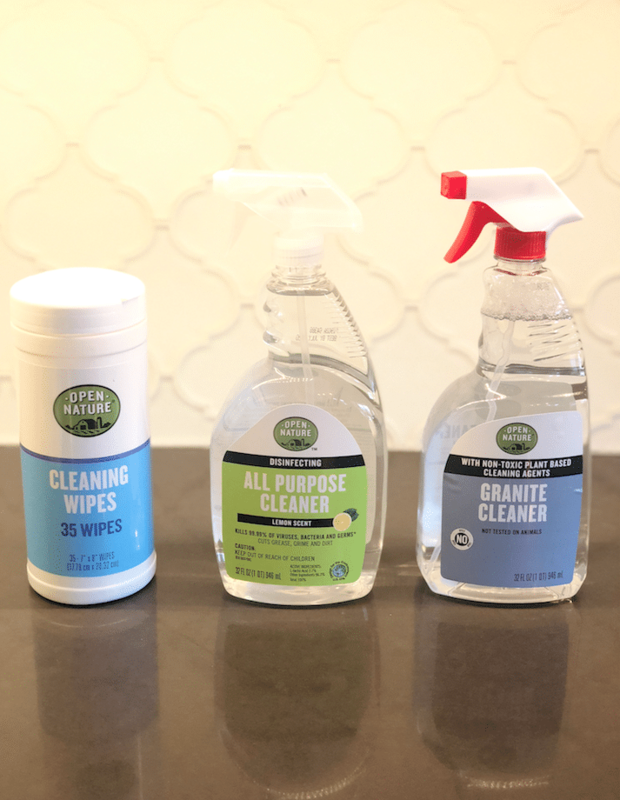 Open Nature Cleaning Wipes – made with more natural ingredients like water, vinegar and denatured alcohol, you can quickly clean surfaces like high-chairs, counters and more with these new wipes and they don’t leave a toxic residue. I was sent a package of a few of the new products to try and I have to say I’m thrilled that these new items are available. I’ve been a loyal Method cleaning products gal for years, so it’s nice to have a less expensive, non-toxic, natural alternative at my local Safeway. The line of Open Nature Cleaning products is on sale for 20% off through April 16th. There are several new Just for U Digital Coupons to pair with the sales, so it’s the perfect time to try a new product for cleaning your house in a more natural way! This is a sponsored post on behalf of Safeway to introduce you to their new line of Open Nature toxic free and eco-friendly cleaning products. As always, we encourage and appreciate your support of the brands that make this site possible.